The upscale Blue Ox Restaurant on Oxford Street has taken notice. When Arts After Hours is producing a show at the Rantoul Black Box Theatre at LynnArts on nearby Exchange Street, business is up, even on a weekday. That makes Corey Jackson happy. 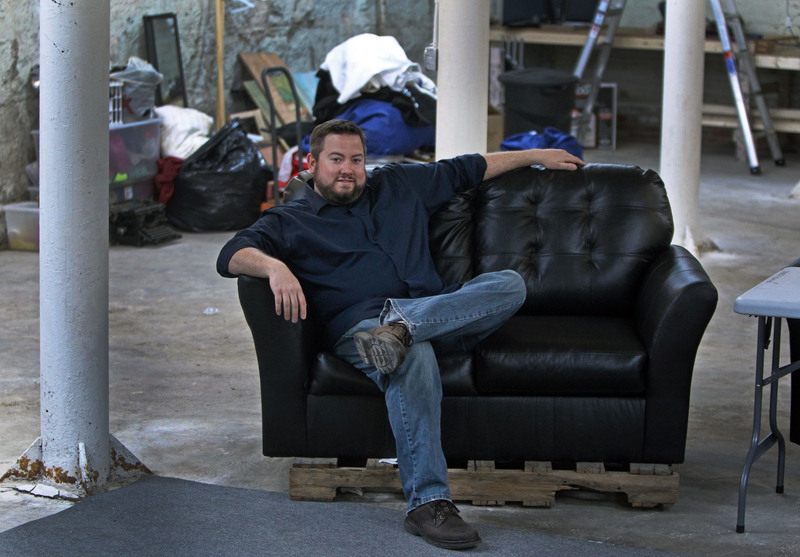 “It’s part of the creative economy we’re trying to grow in downtown Lynn,” he said. Jackson, 35, pays his bills by working as a software project manager for the computer security firm NetIQ. Jackson, a Peabody native who lives in downtown Lynn, has seen what theaters such as the Merrimack Repertory Theatre in Lowell, the Seacoast Repertory Theatre in Portsmouth, N.H., the North Shore Music Theatre in Beverly, and the Stoneham Theatre have meant to the local economies. And now — with the Massachusetts Cultural Council in March naming Lynn’s Central Exchange Cultural District one of the state’s first five official cultural districts — he hopes his group will become part of an arts-fueled economic engine that will lift the downtown. While he’s doing all that, he also has a role in the Stoneham Theatre’s production of “The Full Monty” through Sunday. Jackson is a graduate of Peabody High and its Stage One theater program. Since he graduated from Syracuse University in 1999, he’s been a fixture on the Greater Boston theater scene, working as a director for several groups, and performing at venues in Cambridge, Portsmouth and Stoneham. “It’s the passion of my life,” he said. Jackson cofounded Arts After Hours with Seth Albaum and Jocelyn Almy-Testa, both of whom have moved on to other ventures but still volunteer with the group on a regular basis. Their first event was the Back Yard Bash in August of 2010, which brought musicians, local artists, and culinary experts together for an outdoor festival. They have staged cabaret nights, other musical events, and gallery showings in addition to theatrical productions, joining already established groups such as LynnArts and RAW Art and the national acts performing at the Lynn Municipal Auditorium. “Corey’s group has been a great addition to Lynn and has brought a lot of people downtown,“ said James Cowdell, the director of the Lynn Economic Development and Industrial Corp., which provided the impetus for the cultural district designation. Last June, Jackson directed Arts After Hours’s production of the Tony Award-winning musical “The 25th Annual Putnam County Spelling Bee;” then in January, “I Love You, You’re Perfect, Now Change.” The family musical “You’re a Good Man, Charlie Brown” is currently in rehearsal for shows from May 24 to June 9 at the Rantoul Theatre. This summer, the troupe will venture outdoors for Shakespeare’s comedy “Twelfth Night,” which will be staged at the Pennybrook Road entrance to the Lynn Woods Reservation and environs from Aug. 9 to 19. Ticket sales account for about 50 percent of the budget, while city officials have helped Jackson connect to community and corporate support. “We’ve been able to provide a stipend to actors while breaking even or making money on all our shows,” said Jackson, who credited a volunteer staff led by June Kelly, which allows him to continue acting while leading the group. In Stoneham, Jackson is playing the role of Dave Bukatinsky, one of six unemployed steelworkers in Buffalo who come up with a novel way to raise some cash in the funny, warm-hearted musical “The Full Monty.” Globe reviewer Terry Byrne described the production as “a joyous celebration” and singled out Jackson’s performance for praise. “It’s a musical about working class guys so between Peabody, Lynn, and G.E., it resonates with me,” said Jackson. Lowans said she also takes advantage of Jackson’s experience as a director when she offers advice on a scene. “The director part of his brain understands exactly what I’m trying to say,” she said.